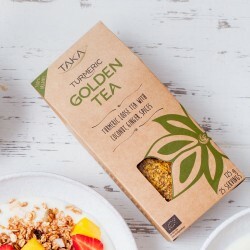 A unique range of turmeric drinks and teas that are as healthy as they are delicious. 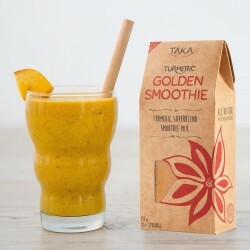 Turmeric was a favourite spice of Talia's mother, who learned about its positive benefits when studying Ayurveda. Her family used turmeric for everything from herbal infusions to grazed knees, and after years of experimenting, her mother’s recipes greatly improved. 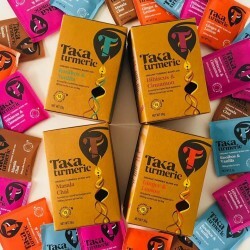 These recipes and her quest to make turmeric tasty inspired Talia to create Taka Turmeric. 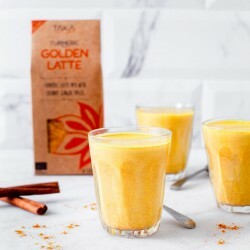 Their range of delicious golden drink blends and turmeric teas are made with the very best organic turmeric, with coconut and black pepper to increase absorption of the active ingredient curcumin. They use only the very best herbs and spices to create a golden synergy of taste and health, and all ingredients are ethically sourced and organically grown.